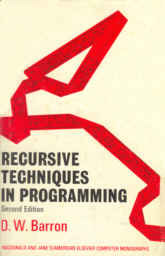 In the evolution of consciousness of this one-time computer programmer, I had to own up to the fact that I knew nothing about recursion. I had avoided it like an envelope of anthrax bacteria. The author rightly points out that if computers had existed in the Middle Ages, some programmers (who never thought about recursion) would have likely burned others (those who used recursion all the time) at the stake. What's the big deal about recursion? Well, it's a little like the bootstrap paradox: to get the first program into a computer, you need to load it with the program loader, which is a program itself. So, how does the program loader get into the computer? The feat is seemingly impossible, and yet every time we re-boot our computer we solve that problem, or rather someone has already solved it for us and all we have to do is push a button or so. Recursion is like that - we push a button or call a function and something magical seems to happen all by itself. To solve the problem of computing the factorial of 3, all we have to do is to multiply 3 times the factorial of 2 which can be calculated by multiplying 2 times the factorial of 1. If you have recursive functions available, the simple solution is F(n) = n*F(n-1), and this will work for all positive values of the integer n. How are we to understand this? •Transformation: transforms object a into object b. •Difference reduction: reduce or remove the difference between objects a and b. •Apply Operator: apply operator q to object a. •Reduce difference between a and b. •Find operator q and apply operator to d.
•if d satisfies conditions for applying q to d, do so, if not, transform d into an object that does satisfy condition and then apply q to d.
Whether or not you understand all of the steps above, it's easy to inspect the italicized words to find that each of the three steps call one of the other two steps to be performed. Thus, you are presented with a set of three nested and recursive routines that call each other continually until the object a is transformed into object b. The author leaves us an important caveat about the use of recursive programming and I'll close this review with that. Good maintainable program code is much more desirable than tricky, but obscure coding techniques. [page 13] The indiscriminate use of recursion is certainly not to be reommended. The programmer must weigh the benefit of a simple program, more easily written, against the extra running time and the possibility of trouble in debugging. When you are unsure about the use of recursive code, the best recourse is follow this simple advice: "When in doubt, leave it out."